Stunning general map of the Yosemite National Park. Topographic Map of Yosemite National Park California. A fine example of Francois e. Matthes' 1930 topographical survey map of the spectacular Yosemite National Park, California. The map covers the entire park along with surrounding areas from Stanislaus National Forest to Mono Lake and the Mono National Forest. The map also features the boundary lines between Mariposa and Madera Counties and Tuolumne and Mono Counties. The Yosemite National Park limits are also marked. Throughout countless well known Yosemite sites are noted, including el Captain, eagles Pea, Mirror Lake, North Dome, Liberty Cap, and Half Dome as well as various other falls, peaks, trails, roads, mountain passes, meadows, lakes, rivers and creeks. Formed over millions of years of interaction between glaciers and rock, this U-shaped valley still undergoes dramatic changes with constant erosion, rock slides and avalanches. Located on the western slope of the Sierra Nevada Mountains and comprising of only 1% of the Yosemite National Park area, the Yosemite Valley is the most attractive and the most visited part of the park. The map is color coded with a legend on the right hand side of the map. 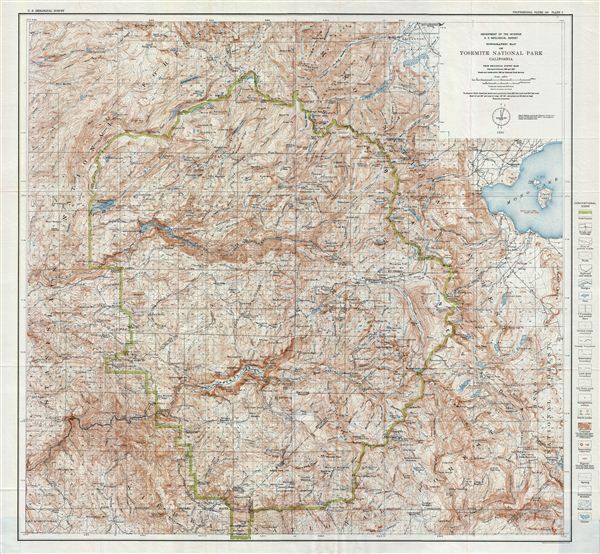 This particular map was published as plate 2 by the United States Geological Survey in 1930 as part of the Geological History of the Yosemite Valley. Matthes, F. E., Geologic History of the Yosemite Valley, (Washington, USGS) 1930.